Fingernail disorders are quite often a cosmetic problem, but sometimes a fingernail disorder may be important signs of a congenital or systemic disease. The most common nail disorders in newborns & infants are: anonychia, micronychia, polyonychia, epidermolysis bullosa, pachyonychia congenita, ectodermal dysplasias, veillonella infection, ingrowing toenail in infancy, racket nails, and the nail-patella syndrome. Anonychia refers to the absence of the nail plate and may be observed with autosomal dominant or recessive inheritance. Congenital anonychia of all nails is rare and is often associated with other ectodermal or mesodermal malformations (e.g., dermolytic epidermolysis bullosa, DOOR [deafness, onychodystrophy, osteodystrophy, and mental retardation] syndrome, Iso-Kikuchi syndrome). The rarely described disorder, DOOR syndrome, has fewer than 35 reports in the literature. The hallmarks of the syndrome, represented in the DOOR acronym, include sensorineural hearing loss, hypoplastic or absent nails on the hands and feet, small or absent distal phalanges of the hands and feet, and mental retardation. Congenital onychodysplasia of the index fingers ([COIF] or Iso-Kikuchi syndrome) is a rare condition characterized by various forms of nail dysplasia commonly involving the index fingers, but, not infrequently, also the neighboring fingers, such as the middle fingers, and thumbs. The nails of COIF include the full spectrum of nail dysplasia, from an irregular lunula, malalignment, micronychia (hypoplastic and rudimental), polyonychia (split rudimental), and anonychia, specifically affecting the index fingers. Drugs that most frequently cause nail plate hypoplasia include warfarin and anticonvulsants. Underlying osseous abnormalities (deformity or absent phalanx) are detected by x-ray. Micronychia is an unusual defect characterized by a small nail plate, shorter or narrower than normal. When this deformity is congenital it is associated with syndromes or toxin exposure. The degree of micronychia may vary in size. Scarring (dystrophic) forms of the spectrum of epidermolysis bullosa may be accompanied by nail lesions. Abnormalities of collagen VII make the nail attachment vulnerable to mild trauma. Recurrent nail loss then leads to scarring and nail dystrophy, mainly of the big toes. Severe scarring may also result in pseudowebbing of all digits and a club-like appearance of hands and feet. 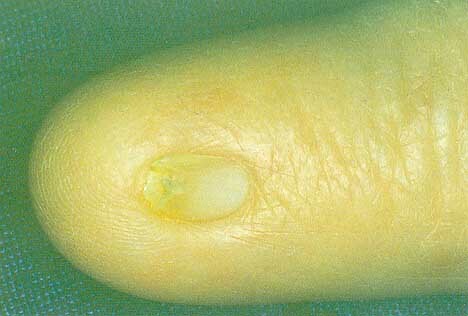 Thickening of the nail (very difficult to trim) presents during the neonatal period with yellowish-brown discoloration. This condition is a consequence of subungual hyperkeratosis and is more evident on the distal part of the nails, which have an upward angling. Pachyonychia congenita is rare and diagnosis is based on family history and on other manifestations of the disease, such as foamy white mucosal plaques, symmetric thickening of the palms and soles, dry-grayish spiny papules over the elbows, knees and other body surfaces. - Type II cases (PC-2) have mutations in keratins 17 or 6b and show natal teeth, corneal dystrophy, hair abnormalities and steatocystoma multiplex. In 1991, Paller et al., have reported a late-onset form, termed 'pachyonychia congenita tarda'. In these cases pachyonychia is apparent during the teenage years. Differential diagnosis of PC includes psoriasis, ichthyosis syndromes, Darier's disease, pityriasis rubra pilaris and mucocutaneous candidiasis. There is no beneficial treatment. 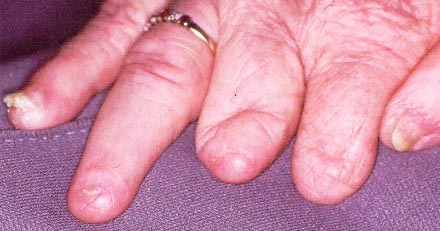 In dyskeratosis congenita, the nail plate is completely absent or hypoplastic. A pterygium formation may also be present. Other associated abnormalities are hyperpigmentation, leukoplakia, Fanconi-like anemia, blepharitis, keratoderma of the palms and soles and dental dystrophy. Infantile ingrowing toenails are thought to have a congenital origin. The thin, sharp edge of the big toenail embeds into the hypertrophic lateral nail folds of the hallux, often bilaterally and usually appears at birth. Congenital hypertrophy of the distal soft tissue of the phalanx may produce a dome-shaped lip that covers the nail plate. This condition improves spontaneously with age. Distal lateral nail ingrowing most probably results from uneven cutting of the nail plate or onychophagia. Congenital malalignment and koilonychia are, in addition, common reasons for ingrowing nails in childhood. Racket nails are broad and shortened, and reflect an underlying disturbance in the formation of distal phalanx, which may be inherited. In some cases the more general term 'brachyonychia' is used. This genodermatosis is an autosomal dominant disorder due to mutations in the LMX1B gene with variable expressivity, where nail abnormalities are associated with bone and renal disorders. The nail abnormalities are recognized at birth and include micronychia or anonychia, especially on the thumbs. The lunula can be triangular or V-shaped and this finding may be pathognomonic for the condition. The patella is aplastic or luxated in 90% of patients. Other bone changes include scapular hypoplasia, scoliosis and hypoplastic lateral humerus epicondyle. Renal and eye involvement is common. Differential diagnosis from other causes of anonychia or micronychia may be accomplished by radiographic examination of pelvis ('iliac horn'). In this rare condition there are several nails on the same digit due to bifurcation of the distal phalanx. It may be seen also in polydactyl and syndactyl patients. A history of maternal teratogen exposure should be sought. Veillonella, a Gram-negative coccus may cause subungual infection on finger nails among newborns in postnatal wards or special care baby units. Thumbs are less frequently involved than the other fingers. The infection fades progressively, without adequate antibiotic treatment, leaving the nail unit normal. The main characteristic of this condition, termed by Baran et al., is a lateral deviation of the nail plate from the longitudinal axis of the distal phalanx. Transverse ridges due to repeated trauma on the thickened nail plate, pronounced curvature towards the distal free edge, onycholysis and discoloration usually are typical features of this congenital abnormality. The most important complication of this situation is an ingrowing painful toenail. Spontaneous improvement occurs in approximately 50% of patients. Treatment must depend on the degree of malalignment and on the associated changes. Surgical procedures offer the best results. Acute paronychia may present as a symptom of nail biting or other local injuries caused by Staphylococcus aureus and herpes simplex virus (HSV) or, less often, by Gram-negative organisms (Pseudomonas, Proteus). This condition presents with pain of the distal phalanx followed by redness and dry swelling. Infection by HSV is distinguished by grouped vesicles containing clear fluid that becomes turbid, although rarely purulent. Tzanck smear reveals multinucleated ballooned giant cells that establish diagnosis. Soft-tissue changes in acute paronychia may lead to onycholysis, Beau's lines or onychomadesis. Distal phalanx also may be involved by impetigo. Vesiculopustular with honey-crusted lesions, usually due to B-hemolytic streptococci, is the pathognomonic clinical feature. Topical and systemic antibiotics or antiviral agents are the treatment of choice. Chronic paronychia is a difficult but very common problem, especially in children who are thumb suckers and nail biters. It presents as a dull-red swelling of the nail fold, that is indurated and raised, with loss of the cuticle margin. Yeasts are the most common causes of this condition (81%) and Candida albicans can be identified by culture in approximately 55% of cases. Herpes simplex infection, often due to HSV1 in children, may affect the terminal phalanx of the finger and produce acute, painful paronychia with a vesicular eruption, surrounded by an erythematous border. The vesicles often coalesce into large, honeycombed bullae and sometimes may be located in the nail bed, producing an area of onycholysis. 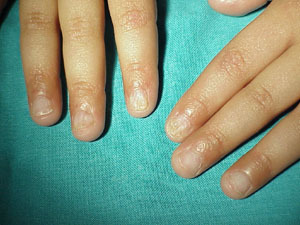 In most cases, this condition is secondary to autoinfection with HSV gingivostomatitis as a result of nail biting or finger sucking. Herpetic whitlow must be differentiated from other vesiculopustular eruption, (e.g., impetigo, blistering distal dactylitis and Hallopeau's acrodermatitis). Oral acyclovir is the treatment of choice and may prevent recurrences. Blistering distal dactylitis, which is usually caused by B-hemolytic streptococci, affects the fingers of children, aged 2-16 years. This condition characterized by large painful tense blisters, with purulent content, at the tip of the digits. Topical antiseptics and systemic antibiotics (e.g., erythromycin or amoxicillin) are the treatment of choice. Two-thirds of children under 12 years of age bite their nails. The etiologies suggested for nail biting include anxiety, stress, loneliness, imitation of a family member, heredity, inactivity and transference from a thumb-sucking habit. Nail biting involves one, many or all nails. Nail biters more often bite the periungual skin and, therefore, paronychia, distal ingrowing or periungual warts are the most frequent complications. The nails appear short and irregular. Longitudinal melanonychia due to activation of matrix melanocytes is a consequence of this habit. Application of distasteful topical preparations (solutions) discourages children from biting their fingernails. It is not clear whether nail biting is related to psychological disorders or not, but most of the experts consider that this condition is not usually associated with psychological problems. Onychomadesis is the complete separation of the nail plate from the nail bed, beginning at the proximal nail fold that induces nail shedding. Severe intrauterine distress may be a cause of onychomadesis in infants, although idiopathic familial onychomadesis has been reported. When it is inherited as a dominant trait, shedding may be periodic. In addition, when this condition affects most or all nails, it usually results from generalized diseases, such as bullous dermatoses, acrodermatitis enteropathica, Kawasaki disease, measles, hand-foot-mouth disease, Stevens-Johnson syndrome, Lyell's syndrome, high fever or drugs. Onychomadesis limited to one or few digits or the toenails is usually caused by trauma, eczema or paronychia. Temporary nail loss may also result from severe onycholysis. White nails (Leukonychia striata) are the most frequent form of chromonychia. In this condition nails are partially or totally milky, ivory or porcelain, white in colour and are evident at birth or during childhood. This disorder can be temporary or permanent, depending on their etiology, idiopathic, caused by a great number of diseases, both congenital and acquired or drug induced (e.g., LEOPARD syndrome, Kawasaki disease, Darier's disease, anemia, zinc deficiency, AA, psoriasis, sulfonamides and retinoids). Melanonychia describes the presence of a brown or black color change of the nail plate. Many causes induce this discoloration, including nevi, drugs, hemorrhage, onychomycoses, dyes, Peutz-Jeghers-Touraine syndrome, Addison's disease and, the most serious, malignant melanoma. Longitudinal melanonychia may be caused by activation or hyperplasia of the nail matrix melanocytes. In children, the most common cause of longitudinal melanonychia is a nail matrix nevus. Most of the nevi in children are junctional. Dermoscopy is a useful method for differentiating between nevi, melanoma and hemorrhages of the nail apparatus. Management of longitudinal melanonychia is generally still debated. Trachyonychia (or '20-nail dystrophy') describes a spectrum of nail-plate surface abnormalities that give the nail plate a rough appearance. This condition usually occurs sporadically, affects one, most, or all nails and is idiopathic or associated mainly with AA or, less commonly, with psoriasis, lichen planus, ichthyosis vulgaris and atopic dermatitis. Shiny trachyonychia: the nail plate is shiny with opalescent longitudinal ridging. This variety is less severe, resulting by a myriad, diffuse regular, superficial pitting Trachyonychia is generally a benign condition that never produces nail scarring and tends to regress spontaneously over the years. For this reason, there is no need to treat trachyonychia in children. Eczema affects the skin of the phalanx and periungually, causing inflammation of the nail matrix and, therefore, pitting, Beau's lines and transverse ridges of the nail plate. The proximal and lateral nail folds may be red, swollen with small vesicles and with loss of cuticle. Acute or chronic paronychia is also present. Psoriasis of the nails is quite common in childhood, its occurance ranges from 7 to 40% in children and varies in severity of involvement. Nail changes include pitting, onycholysis, subungual hyperkeratosis, yellowish green-brown spots under the nail plate (oil spot), splinter hemorrhages, multiple transverse grooves, splits, atrophy, fragility and trachyonychia (roughened nail). Periungual involvement may be severe, giving rise to a disruption of the nail matrix. The nail fold may be scaly and the cuticle is lost. Treatment of nail psoriasis is always disappointing. Topical calcipotriol or topical/intralesional steroids are, however, moderately effective. Acropustulosis is a clinical form of psoriasis and affects few or only one of the digits, especially in young girls. It is characterized by a relapsing pustular eruption. Often, for no apparent reason, (or, according to some authors, after a minor trauma), a suppurative process begins with the formation of crops of pustules on an erythematous base, particularly on the fingertips and, rarely, on toes. Nails of the involved digits may show onycholysis, subungual hyperkeratosis or partial nail-plate destruction. Pustulation of the nail bed and nail matrix may lead to severe onychodystrophy or even to onychomadesis. The distal pulp in most of cases shows mild erythema and scaling. It is often misdiagnosed as onychomycosis. Acropustulosis usually regresses spontaneously, although some children may develop later nail psoriasis. Pitting, fragile distal edge, roughened surface ('sandpaper nail'), onychomadesis, trachyonychia and loss of lunula are present in 10-66% of children with AA. 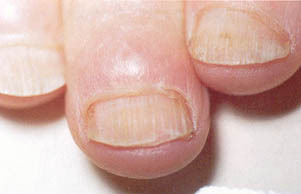 Pits on the nail plate are shallow and wider than those in psoriatic nails (1-2 mm). Nail involvement is generally considered a bad prognostic marker for AA. Lichen planus of the nails in childhood is very rare and may overlap with the 20-nail dystrophy of this age. Lichen planus affects fingernails more frequently than toenails and the most common changes include slight thinning of the nail plate, brittleness, onychorrhexis, longitudinal ridging and trancient or permanent longitudinal melanonychia. Rarely, a fibrotic band of tissue fusing the dorsal nail fold with the nail bed, causes partial destruction of the nail plate (pterygium unguis). Onychomycosis is rare in early childhood and has been examined in a few studies. The prevalence of childhood onychomycosis is estimated 0.2%. The age range for onychomycosis in children is 6-14 years of age. Older children and teenagers are affected more frequently. Biting or sucking of digits from the first months of life can lead to maceration of the digits and exposure to C. albicans. Candida infection of the thumb nail with associated paronychia is common in children with mouthing. The fingernails are usually affected and the nail-fold inflammation leads to deformity of the nail plate, appearing as irregular Beau's lines, opaque milky white or yellow-brown discoloration, thickening and onycholysis. In most cases, the disease of newborns resolves spontaneously in a few months and rarely tends to be chronic and interrupted by subacute exacerbations. Dermatophyte onychomycosis presents in children after the age of 6 years, usually with distal thickening whitish yellow discoloration of the free edge of the nail and subungual hyperkeratosis. Distal subungual onychomycosis is due to infection with Trichophyton rubrum. This feature is attributed to the subungual accumulation of friable keratinous debris and entrapment of air between the nail plate and nail bed due to onycholysis. Proximal subungual onychomycosis occurs when the cuticle of the proximal nail fold is disrupted and fungal invasion raises, and it is extremely uncommon in children. Superficial white onychomycosis appears as a white, sharply outlined area on the nail plate and is considered more common. It is frequently due to T. mentagrophytes and usually involves one-to-two digits. A careful clinical examination is required, as a fungal skin infection can usually be detected elsewhere (tinea pedis or tinea of the scalp mostly). Potassium hydroxide examination and culture of the subungual debris confirms the diagnosis. A family history of onychomycosis is present in few cases. There appears to be an increased incidence of onychomycosis in children when there is a large number of older siblings and when parents are affected. This familial pattern may be an opportunistic infection or a genetic predilection for fungal infection. Severe onychomycosis in children raises suspicion for immunosuppression, such as mucocutaneous candidiasis or HIV infection. Psoriasis, lichen planus, 20-nail dystrophy, trauma and AA mimic onychomycosis and should be considered in the differential diagnosis. Treatment of onychomycosis in childhood is similar to that in adults and usually requires systemic antifungal agents. However, as children appear to respond faster than adults, there is a tendency to use topical therapy, including amorolfine 5% lacquer, ciclopirox 5% lacquer or imidazoles. Griseofulvin is still the drug of choice worldwide. Experience with the newer systemic drugs is relatively limited in children. Itraconazole (5 mg/kg/day), terbinafine (3-6 mg/kg/day) and fluconazole (6 mg/kg/day), for 6 weeks for fingernail infection and 3 months for toenails, have been used for the last 15 years but their optimal treatment schedules and toxicity in young children are not yet accurately determined. Periungual and subungual tumors are very rare in childhood, with the exception of warts and pyogenic granulomas. Warts originate from the hyponychium or the nail folds and spread to the nail bed. Subungual warts cause onycholysis and may be painful. Aggressive treatments are often not necessary because warts in many cases disappear spontaneously. Pyogenic granulomas are common and almost always follow a minor trauma or ingrown nails.